The subject of tongues is worth study because it is in the Bible, and we need to learn how it deals with this important subject for two great reasons. First, the tongues, or charismatic movement, is experiencing rapid growth. Seeking for a deeper experience, well-meaning and sincere Christians have been led into the movement. Due to a false understanding, thousands of believers seek for the experience of speaking in tongues in stead of for the power and fullness of the Holy Spirit to win souls. On the other hand, many more thousands of Christians are so repulsed by what seems to them fanaticism, that they turn entirely away from any study of the fullness of the Holy Spirit. They are so afraid they will get out on a limb that they never bother to climb the tree. I want Christians everywhere to be filled with the blessed Holy Spirit of God. There can be no great soul-winning churches, no revival, without the power of the Holy Spirit. Zechariah 4:6 states, "Not by might, nor by power, but by my spirit, saith the Lord of hosts." Now there is a second great reason for studying the question of speaking in tongues. There is such widespread difference of opinion among sincere believers that the truth of the matter should be known. Every honest Christian should approach the study of tongues with an open mind and without prejudice. Surely God must be grieved when those who love Him and believe the Bible think so harshly of one another and differ so radically on such an important subject as being filled with the Holy Spirit. In this study I will not talk about experience; we will only see what the Bible says. If one's experience does not agree with the Bible, the experience is wrong, not the Bible. Experience is not the principle; the Bible is. And doctrine is not settled by one's experience but by what the Bible has to say. Several years ago a popular weekly television program featured a detective. If I recall correctly, his name was Sergeant Friday. In every story a situation developed in which Sergeant Friday said to a witness whom he questioned, "Just the facts, Mister. Just state the facts." With God's help, I shall do just that. We will see what the Bible says concerning the meaning of it, the motive behind it, the method for it, and the misunderstanding about it. "And they were all amazed and marveled, saying one to another, Behold, are not all these which speak Galileans? And how hear we every man in our own tongue, wherein we were born? Parthians, and Medes, and Elamites, and the dwellers in Mesopotamia, and in Judaea, and Cappadocia, in Pontus, and Asia, Phrygia, and Pamphylia, in Egypt, and in the parts of Libya about Cyrene, and strangers of Rome, Jews and proselytes, Cretes and Arabians, we do hear them speak in our tongues the wonderful works of God. " -- Acts 2:7-11. Notice the language of Acts 2. Verse 4 states, "They were all filled with the Holy Ghost, and began to speak with other tongues .... " It does not say they spoke with the unknown tongue; they simply spoke with other languages Verses 7 and 8 say, "And they were all amazed and marveled, saying one to another, Behold, are not all these which speak Galileans? And how hear we every man in our own tongue, wherein we were born?" Again the Bible does not say they spoke with some heavenly language and every man understood them because he was filled with the Holy Spirit. It simply says, "And how hear we every man in our own tongue, wherein we were born?" Then verses 9 through 11 list the nationalities of people whose languages were being spoken. There are only three places in the book of Acts whet people spoke in tongues. Namely, at Pentecost -- Acts 2:1 11; in Caesarea -- Acts 10:44-46; and in Ephesus -- Act 19:1-6. In Acts 10:46 we are told how Cornelius and hi household were heard to "speak with tongues, and magnify God." And Peter responded by saying, "Can any man forbid water, that these should not be baptized, which have received the Holy Ghost as well as we?" These were ne converts, and Peter suggested baptism. The tongues spoken by Cornelius and his household were not miraculous tongues. It simply says that they spake with tongues and magnified God. Cornelius and his household were members of the Italian band from Rome, and their natural language was Latin. It is possible that in the centurion's household were soldiers, slaves, servants and government officials from many of the nations of the Roman world. Could it have been that in their heavenly ecstasy they reverted each to his mother tongue in praising God? It is a psychological truth that in moments of extreme delight or peril a foreigner will exclaim in his native tongue rather than in the language he has more recently acquired. But be that as it may, the tongues referred to in Acts 10:46 were known languages, not an ecstatic utterance. The third historical record of people speaking in tongues in the book of Acts is found in chapter 19:1-6. When Paul met these twelve men in Ephesus, he asked, "Have ye received the Holy Ghost since ye believed?" Their reply was that they had never heard of the Holy Spirit. Now how could followers of John the Baptist be ignorant of the Holy Spirit, when he preached the Holy Spirit (Matt. 3:11)? Evidently the true message of John the Baptist had been lost as it was passed from one disciple to another; then when these misled men heard a clear presentation of the Gospel, they were baptized (vs. 5). Verse 6 states, "And when Paul had laid his hands upon them, the Holy Ghost came on them; and they spake with tongues, and prophesied." Here again the Bible does not say they spoke with heavenly languages or in some ecstatic utterance, but that they spoke with tongues, or languages. Ephesus, a great cosmopolitan city, was made up of people from different parts of the Roman world. The Bible does not indicate what languages were spoken. But it clearly indicates that more than one language was used: "...they spake with tongues" (plural). And verse 7 states, "And all the men were about twelve." It is possible that a dozen different languages were spoken, as these new Christians, filled with joy, prophesied. Aside from these three instances in the book of Acts, tongues are mentioned in Paul's discussion of the gifts of the Spirit (I Cor. 12:1-14) and in I Corinthians 14. A study of I Corinthians 14 will reveal that the tongues mentioned are not so-called spiritual or heavenly languages. The languages used were normal, human languages. It was no jabber, no babble of sound unfamiliar to any human ear. "If therefore the whole church be come together into one place, and all speak with tongues, and there come in those that are unlearned, or unbelievers, will they not say that ye are mad? But if all prophesy, and there come in one that believeth not, or one unlearned, he is convinced of all, he is judged of all." Now, visualize the scene. A church service is in progress and people are speaking in numerous foreign languages. Some uneducated or unlearned person, as the Scripture calls him, happens to walk into the service. He hears a number of people, all speaking with various languages; it is mass confusion, so he concludes all are mad! But if the church members would speak words easy to understand, instead of speaking in foreign languages that the unlearned do not know, then the unbeliever and the unlearned man would be convinced of all. The use of the word "unlearned," in verses 23 and 24, shows that the languages referred to were not supernatural. They could be learned by proper study. One can learn any foreign language if he studies it enough. If the languages used in I Corinthians 14 were a supernatural gift, then it would be available to the unlearned as well as the educated. If speaking in tongues means speaking in some mysterious language known only to God and not known to any group of men, no matter how much learning and education a man has, he will not understand the heavenly language. But foreign languages, known and spoken by men, can be learned. The fact that these languages were the kind that unlearned men did not understand indicates they were known, normal, human languages. Remember, then, that tongues in the Bible simply mean languages and, in the case of I Corinthians 14, foreign languages, unknown by some who attended the church services. I have already mentioned that there are only three places in the Bible where people spoke in tongues: Acts 2:1-11; 10:44-46; 19:1-6. The central and most important Bible passage on the subject of tongues is found in Acts 2:1-11. First, it is important because it is the first time tongues are discussed in the New Testament. Second, it is important because speaking in tongues was on a larger scale in Acts 2 than in either of the other cases mentioned. Third, it is the most important passage because this is the only instance where we can be absolutely sure that speaking in tongues was a miraculous gift. Acts 2:4 states: "And they were all filled with the Holy Ghost, and began to speak with other tongues, as the Spirit gave them utterance." In Acts 10 and 19 the Bible simply says they spake with tongues. There is no hint that speaking in tongues in Acts 10 or 19 was a supernatural gift. Only in Acts 2:4 does the Bible say "as the Spirit gave them utterance." Now, what was the motive behind this supernatural gift on the day of Pentecost? There were at least 3,000 unsaved people present. There could have been more; but according to verse 41, three thousand souls were saved: "Then they that gladly received his word were baptized: and the same day there were added unto them about three thousand souls." On the day of Pentecost, God had a problem: 3,000 un-saved people were present. The Galileans knew the plan of salvation. They could present the Gospel clearly, but they could not speak in the languages of those who needed to hear the message. The problem God faced was language barrier. He wanted these 3,000 precious souls to be saved, but the men who knew how to present the Gospel could not speak in the languages of the unconverted. So God allowed them to speak in languages which they had not learned. They spoke in other languages supernaturally, in the words of Acts 2:4, "...as the Spirit gave them utterance." "And they were all amazed and marveled, saying one to another, Behold, are not all these which speak Galileans? And how hear we every man in our own tongue, wherein we were born? Parthians, and Medes, and Elamites, and the dwellers in Mesopotamia, and in dudaea, and Cappadocia, in Pontus, and Asia, Phrygia, and Pamphylia, in Egypt, and in the parts of Libya about Cyrene, and strangers of Rome, Jews and proselytes, Cretes and Arabians, we do hear them speak in our tongues the wonderful works of God. " --Acts 2:7-11. When these precious unconverted people heard the Gospel, they trusted Jesus Christ as Saviour. And the Bible states in Acts 2:41, "Then they that gladly received his word were baptized: and the same day there were added unto them about three thousand souls." The important thing on the day of Pentecost was not the speaking in tongues but the conversion of 3,000 sinners. And that places importance on soul winning, not on speaking in tongues. The tongues were secondary and incidental. They were only a means to an end; the end was soul win ning. "But ye shall receive power, after that the Holy Ghost is come upon you: and ye shall be witnesses unto me both in Jerusalem, and in all Judaea, and in Samaria, and unto the uttermost part of the earth." "For he shall be great in the sight of the Lord, and shall drink neither wine nor strong drink; and he shall be filled with the Holy Ghost, even from his mother's womb. And many of the children of Israel shall he turn to the Lord their God." To put the emphasis on speaking in tongues would be like having someone bring you a million dollars in a brown paper bag, and you dump the money into the trash and get excited over the paper bag. The paper bag was the instrument in which the money was delivered. The money is the important thing, not the bag. The tongues on the day of Pentecost were the instrument through which the message was delivered that resulted in 3,000 souls saved. The salvation of 3,000 sinners was the important thing, not the tongues that delivered the message. Winning souls was the motive behind speaking with tongues in Acts, chapter 2. Aside from the three instances recorded in the book of Acts, one other place in the New Testament mentions speaking in tongues. It is in Paul's discussion of the gifts of the Spirit in I Corinthians 12:1-14. Verse 10 lists, among other gifts, "divers kinds of tongues." The church at Corinth is the only New Testament church that spoke with tongues. It is never mentioned in connection with the churches in Macedonia, Achaia, Judea, Samaria, Asia, Rome or any other place. First Corinthians, chapter 14, does not contain a list of exhortations to speak in tongues but a long list of restrictions against the practice. Paul is not encouraging the Christians at Corinth to exercise the gift but to refrain from its use. He is not giving a set of rules on how to speak in tongues but rather laying down strict regulations to restrain its use in the church. Before giving a number of these regulations found in I Corinthians 14, I should call attention to the fact that the tongues in I Corinthians 14 are different from those in Acts 2, Acts 10 and Acts 19. In Acts 2 the disciples simply preached the Gospel in the languages of those present. They heard the Gospel, trusted Christ as Saviour and 3,000 were saved. The tongues used on the day of Pentecost were not unknown languages to the hearers. The tongues mentioned in I Corinthians 14 were unknown to the congregation. They were foreign languages not known by the people in the church, thus they were unknown tongues. Now, notice several regulations Paul lays down in regard to speaking in tongues. First, no tongues or foreign languages were to be used in the church except when people present understood what was being said. "If any man speak in an unknown tongue, let it be by two, or at the most by three, and that by course; and let one interpret. But if there be no interpreter, let him keep silence in the church; and let him speak to himself, and to God. " -- I Cor. 14:27, 28. Second, there should never be more than two or three in any service speaking in other languages or tongues. "If any man speak in an unknown tongue, let it be by two, or at the most by three, and that by course; and let one interpret" (vs. 27). Third, only one person was to speak at a time. Any time two or three were speaking at the same time it was clearly out of order. "...let it be by two, or at the most by three, and that by course" (I Cor. 14:27). If tongues were ever spoken in a service, it had to be "by course," never two speaking at the same time. Fourth, any religious service where speaking in tongues caused confusion was clearly not of God: "For God is not the author of confusion, but of peace, as in all churches of the saints" (I Cor. 14:33). "Let your women keep silence in the churches: for it is not permitted unto them to ,speak; but they are commanded to be under obedience, as also saith the law. And if they will learn any thing, let them ask their husbands at home: for it is a shame for women to speak in the church. " -- I Cor. 14:34, 35. That is a strange statement for the Apostle Paul to make, since in I Corinthians 11:3-10 he had just given instructions how women were to dress when they prayed or prophesied in the church. Now, in I Corinthians 14:34 and 35 he says they are not to speak at all but to keep silent. Has he forgotten what he has just written? Is he stupid? Has he lost his mind? No, not at all. These verses forbid-ding women to speak in the church are found in the middle of this chapter on speaking in tongues. He is giving regulations on the use of tongues in the church, and he says the women are to keep silent. They are not permitted to speak! "In front of the ancient city of Corinth was the deep blue sea. Behind the city of Corinth was the steep, high Acro-Corinthus, an Acropolis far more prominent than that in Athens on which was built the Parthenon. Crowning the imposing Acropolis at Corinth was a magnificent temple to Aphrodite (Latin, 'Venus'). "The Greek goddess of love and beauty was worshiped with sexual orgies. The temple prostitutes who were used in these orgies of worship worked themselves up into ecstatic frenzies as they followed their heathen, immoral rituals. "The sight of frenzied women speaking in unknown tongues in their dedication to immorality was a common one in the days of Graeco-Roman culture. Paul's abhorrence of such speaking is explicable and obvious. Paul assumes that even strangers walking by an assembly of God's people, seeing and hearing the women talking in unknown tongues, would immediately say: 'What have we here; a little colony of Aphrodite? Let us go in and enjoy the sensual pleasure.' 'No,' said the apostle, 'a thousand times no! "That interdiction still stands, unremoved. The hysterical, unseemly excess of tongue-speaking women in public worship is a reproach to the name of the Lord." "I thank my God, I speak with tongues more than ye all: Yet in the church I had rather speak live words with my understanding, that by my voice I might teach others also, than ten thousand words in an unknown tongue. " --I Cor. 14:18, 19. These are tremendous odds -- 5 to 10,000! This would be enough to stop the practice of tongues forever in the judgment of any ordinary fair-minded person. The practice has no, place in the church. Recently I wrote on the margin of my Bible five reasons why tongues were not suited for public worship services. It could not be generally understood and therefore required the services of an interpreter to be of any value. It repelled unbelievers and did not edify believers who could not understand what was being said. It led unbelievers to conclude that those who spoke in this unintelligible manner, when they could have used known languages, were out of their minds; they were mad. It might lead the hearers to conclude that God is the author of confusion, since those who spoke in tongues claimed to do so by the power of the Holy Spirit. It actually thwarted God's purpose which is that His witness should be understood by all. Why use such a round-about way to get the truth to people? God never used such means nor did the apostles. There are several misunderstandings regarding speaking in tongues. Some say it is the evidence of the fullness of the Holy Spirit. Others say tongues is a prayer language and they speak to God in tongues. Still others insist that speaking in tongues is a sign of spirituality. When one becomes spiritual enough he will speak with tongues. 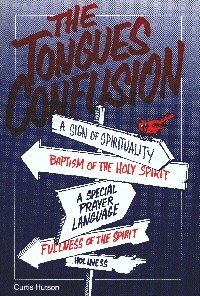 Is speaking in tongues the evidence of the fullness of the Holy Spirit? Let us see what the Bible says. There is not a single statement--either before or after Pentecost--in which the Bible speaks of the gift of tongues as the evidence or part of the evidence of being filled with the Holy Spirit. This is a doctrine not founded upon a single clear statement in the Word of God. "The doctrine that speaking with other tongues is the initial evidence of the Baptism of the Holy Spirit rests upon the accumulated evidence of the recorded cases in the book of Acts where this experience is received. Any doctrine on this point must necessarily be confined within these limits for its basis, for the New Testament contains no plain, categorical statement anywhere as to what must be regarded as THE sign." Those who teach that speaking in tongues is the evidence of the fullness of the Holy Spirit get such an idea from history, from books or from human experience, not from the Bible, since it says nothing about it. There are good reasons to believe that speaking in tongues is not the evidence of the fullness of the Holy Spirit. First, as I have mentioned, the Scripture nowhere says that speaking in tongues was the evidence. Second, another evidence was promised. Acts 1:8 states, "But ye shall receive power, after that the Holy Ghost is come upon you: and ye shall be witnesses unto me both in Jerusalem, and in all Judaea, and in Samaria, and unto the uttermost part of the earth." Here the Bible says that when they were filled with the Holy Spirit they would receive power to witness. That is exactly what happened in Acts, chapter 2. Filled with the Holy Spirit, they preached the Gospel and 3,000 souls were saved! It is said of John the Baptist in Luke 1:15,16, "For he shall be great in the sight of the Lord, and shall drink neither wine nor strong drink; and he shall be filled with the Holy Ghost, even from his mother's womb. And many of the children of Israel shall he turn to the Lord their God." Notice it says nothing about John the Baptist speaking in tongues. It does say, "And many of the children of Israel shall he turn to the Lord their God." When he is filled with the Holy Spirit, he will be a great soul winner. If there is an evidence of the fullness of the Holy Spirit, it is soul winning, not speaking with tongues. Third, there are examples in the Bible of those who were filled with the Holy Spirit but did not speak in tongues: Jesus--Luke 3:21,22 and Acts 10:38; John the Baptist--Luke 1:15, 16; the converts at Samaria--Acts 8:14-17; the Apostle Paul--Acts 9:17. The great soul winners of our day are men who have been filled with the Holy Spirit but never spoke in tongues. Then there are the great evangelists and preachers of yesteryear who were filled with the Holy Spirit but never spoke in tongues: Dwight L. Moody, Charles G. Finney, Dr. R. A. Torrey, John Wesley, George Whitefield, Charles Haddon Spurgeon, Billy Sunday, J. Wilbur Chapman, George Truett, Gipsy Smith and many, many others. Since God gave another evidence of the fullness of the Holy Spirit, it is wrong and foolish for anyone to believe that speaking in tongues is the evidence when God says nothing of the kind. There is another misunderstanding regarding speaking in tongues. Some who speak in tongues say it is a prayer language, basing the teaching on I Corinthians 14:2, "He that speaketh in an unknown tongue speaketh not unto men, but unto God." A little study here will clarify your mind. This verse simply says if a man speaks in the church in a foreign language, which no one understands, then he is not speaking unto men but unto God. Then the verse goes on to explain, "...for no man understandeth him." The Scripture does not say and does not mean that the tongues mentioned here were a language known only to God. An unknown tongue is any foreign language unknown to you or unknown to the person who hears it spoken. If I spoke in Chinese to an English-speaking audience who did not understand Chinese, I would not be speaking to men because they would not understand the language. I would be speaking to God, since He understands and knows all languages. What God has in mind here is simply foreign languages unknown to those present but not unknown to God. Recently in a restaurant, I sat near several people who were speaking in a language unknown to me. As I enjoyed my meal, I wished I could understand what they were saying. But they were not speaking to me since the language spoken was unknown to me. However, the language they were speaking in was not unknown to God, and He heard and understood every word. There is no such thing as a special prayer language. God understands one language as well as the other. He is omniscient. There is no language unknown to God. He hears every conversation. Several years ago I led a lady to Christ who knew very little English. When I asked her to pray, she indicated that she could not speak the English language well enough to pray. I suggested that she pray in her own native tongue, which she did. The tongue was unknown to me. I have ab solutely no idea what she said, but I am sure God heard every word. And when she had finished praying, a glow came over her face as she reached out to shake my hand. The next Sunday I had the happy privilege of baptizing her, and she made a faithful church member. There is no such thing as a special prayer language. "I have fed you with milk, and not with meat: for hitherto ye were not able to bear it, neither yet now are ye able. For ye are yet carnal: for whereas there is among you envying, and strife, and divisions, are ye not carnal, and walk as men?" Here the Bible specifically says the church at Corinth was carnal and not spiritual. They were not able to eat strong meat and must be fed on the milk of the Word (I Cor. 3:2). Some of them were puffed up and offended with Paul (I Cor. 4:18). There was fornication among them: a man living in sin with his stepmother and the church openly taking his part (I Cor. 5:1). Church members were going to law with one another before unbelievers (I Cor. 6:1-8). Some of the church members ate meat offered to idols (I Cor. 8). There were divisions and heresies at the Lord's Supper, and some came to the communion drunk (I Cor. 11:17-21). Some church members denied the resurrection (! Cor. 15: 12). The only church in the Bible where members spoke in tongues was not spiritual but carnal. So, speaking in tongues could not be a sign of spirituality. Now, these closing words. I would exhort every Christian to be filled with the Holy Spirit. You may as well try to beat back the tide with a pitchfork as to try to do God's work without the fullness of the Holy Spirit. When you are filled with the Holy Spirit, then spend your time winning souls to Christ. The whole purpose of the Holy Spirit's coming into the world was to "reprove the world of sin, and of righteousness, and of judgment" (John 16:8). What does it matter if you speak with the tongues of men and of angels and never lead a soul to Christ! What difference would it make if you could speak a dozen languages--whether by human wisdom or by a miracle--if you never gave anyone the plan of salvation or told a sinner how to be saved? Be filled with the Holy Spirit and win souls. This, and other booklets, can be obtained by contacting Sword of the Lord Publishers directly, please do not direct your queries to Roy Lister (me), though I will be happy to answer any questions regarding the subject matter of the material shown here.